"With an impressive array of rendering styles and surface textures, and a healthy dose of sleight of hand, Wendell Gladstone lures you into his mysterious dreamscapes. He invites you to join a program already in progress, your eyes racing to take in a drama that is unfolding in multiple dimensions." The central figure in “Chain Reaction” carries a sack of cobbled stone while a whirlwind of unfurling limbs and snapping chains spiral toward a climactic explosive thrust of a high heel pump and a radiating kiss goodbye from a series of floating lips. A portrait of Sisyphean liberation from a personal prison. For my first introduction to the print medium, it was important for me to work in a manner that wasn’t derivative of my paintings, yet would retain some of the tactile qualities of my overall practice. Embossment allowed for that balance, opening up new ways for me to expand upon my approach to drawing and composition. Each distinct impression in this variable edition of nine has been custom colored with hand-mixed pearlescent powders in a palette inspired by 1970s eyeshadow colors. 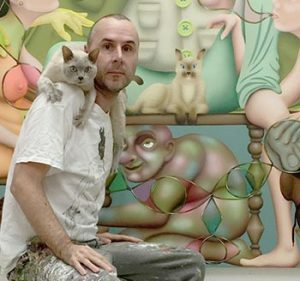 About Wendell Gladstone: Based in Los Angeles, Gladstone produces figurative paintings that evoke dream-like spaces, free from logic that pertains to traditional representation. He uses allegory and metaphor to examine a wide swath of cultural references from contemporary politics, art history, and personal experience, allowing psychological mood to govern the narratives over concrete reality. With a bright, often candy-colored palette layered with transparent mediums that subtly reveal the forms beneath, his works immediately seduce the viewer and only later reveal psychologically charged subtexts. Wendell Gladstone (b. 1972, Boston. Lives and works in Los Angeles) received his BA at Brown University, an MFA in Painting at Claremont Graduate University, and attended the Skowhegan School of Painting and Sculpture.